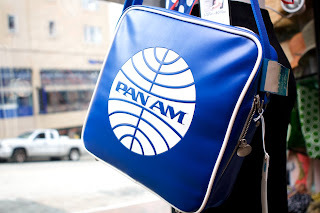 Traveling is not what it used to be.The romance is gone, most would say.We have found a tiny slice of that romance in the form of Pan-Am vintage travel bags. Reproduced in loving detail, these bags harken to an era when air travel was a swinging affair. Come check out all the styles and colors, and grab one for your next trip. We are thrilled the arrival of these bags coincides with the World Premiere of the musical Catch Me If You Can, opening this July at the 5th Avenue Theatre.